STILLWATER, Okla. – The Oklahoma soccer team dropped a 2-1 decision to Oklahoma State Sunday night at Neal Patterson Stadium in Stillwater, Okla. This was the first of two Bedlam games to be played this season, with OSU coming to Norman on Sept. 30 for the second game of the series. 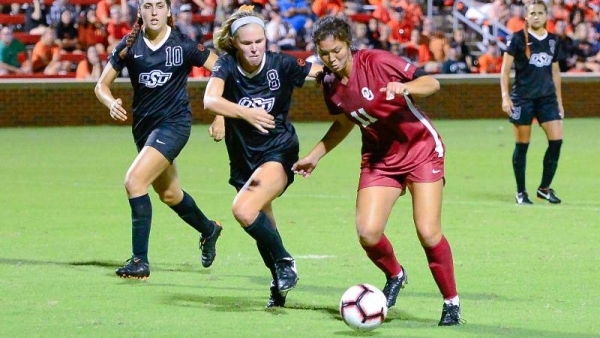 Redshirt junior Kaylee Dao scored the lone goal of the night for the Sooners in the 88th minute. Freshman Megan Reilly had a shot attempt blocked before Dao corralled the loose ball, firing from 12 yards out and putting the Sooners on the board. OU gave up a pair of goals in the first half to trail OSU, 2-0, after the first 45 minutes of play. A foul inside the penalty box set up a penalty kick for Oklahoma State, giving them a 1-0 lead in the 15th minute. In the 29th minute, OSU added to its lead on a shot from Elena Brynjarsdottir. Sophomore keeper McKinley Crone came off her line to try and corral the ball, but Brynjarsdottir was able to slot the pall just past Crone to extend the Cowgirls lead. Lauren Haivala earned the first shot of the night for either side in the 15th minute, sending the attempt just wide of the goalpost. In the 39th minute, the Sooners took the first corner of the game with Reilly sending a beautiful kick into the 18-yard box. Dao was able to get her head on the ball but couldn’t convert to put the Sooners on the board. The Sooners continued to pour on the shots, tallying six in the final six minutes of the half, but couldn’t find the back of the net. OU held the 3-0 corner kick advantage but couldn’t convert on any of the set piece opportunities. The Sooners also finished with an 11-10 shot advantage over OSU. The Sooners will return to John Crain Field for a pair of games this weekend. OU will host Illinois State on Friday, Aug. 24, at 7 p.m., before welcoming Gonzaga to Norman on Sunday, Aug. 27 at 3 p.m.